Ah, Redwall. Where various species of bipedal animals eat copious amounts of food. Seriously, there's like a feast and banquet in each book. And there are 23 novels in the series plus a couple of picture books. Wheras I haven't read them all, I did read many of them as a kid and boy did my mouth water. And look, here's a cookbook (left). This is on my "to own someday" wish list. But in the mean-time I can drool over the recipes at the sites listed below. The food is all vegetarian except for some fishes & shrimps. I mean, the animals aren't cannibals, you know. And Redwall is an abby after all. While you're at it, take a look-see at my previous post about Brian Jacques and the Redwall series (it's an "in memorium" post). 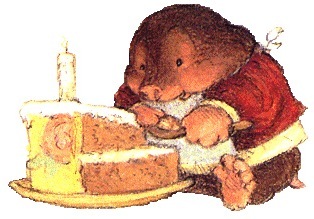 * Redwall Recipes on Sparkpeople + this one & this one. * "Meg's Kitchen: The Redwall Diet: Making & Eating Food w/ Love"
Recipes @ these sites include: Candied Nuts, Traveling Fruit & Honey Cake, Dandelion Cordial, Mole's Favourite Turnip & Tater Deeper n' Ever Pie, Otter's Hotroot n' Shrimp Soup, Candied Rose Petals, Phantom Warrior Soup, Seaweed Grog (non-alcoholic), Bunfold's Meadowcream Cake, & Sea Otter's Savory Scone Spread. Plus so many more! 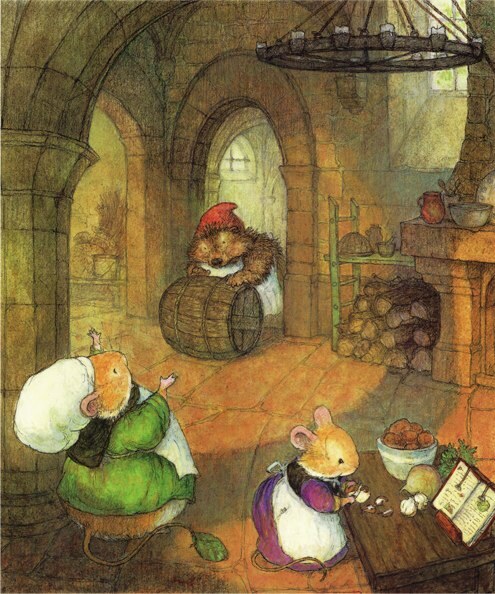 * Website for Christopher Denise, illustrator of the 2 Redwall picture books, The Great Feast & A Redwall Winter's Tale, + the Redwall Cookbook (artwork ft. above & left). 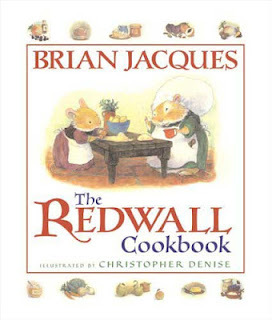 Redwall recipes!?!??! That is so cute and awesome! I know, right?? Someday I'll prepare a Redwall feast!